These two British cigarette trade cards were issued by W.D. & H.O. Wills (tobacco manufacturer) in 1926. They are part of the 50 Wills's Cigarettes 3rd series cards called “Do You Know”. In the UK, Wills in 1887 were one of the first companies to include advertising cards with their cigarettes. The first card (no. 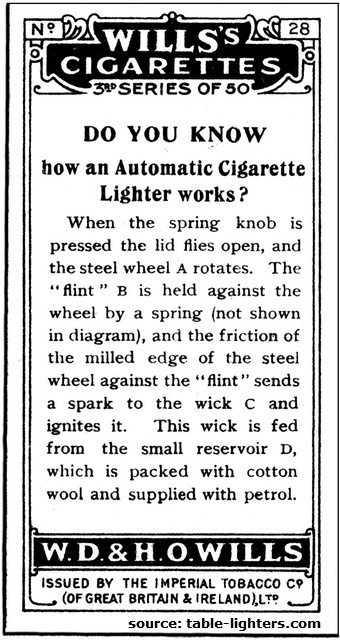 28) shows the anatomy of an "automatic lighter" (actually it is a semi-automatic lighter). When the spring knob is pressed the lid flies open, and the steel wheel A rotates. The “flint” is held against the wheel by a spring (not shown in the diagram), and the friction of the milled edge of the steel wheel against the “flint” sends a spark to the wick C and ignites it. The wick is fed from the small reservoir D, which is packed with cotton wool and supplied with petrol. 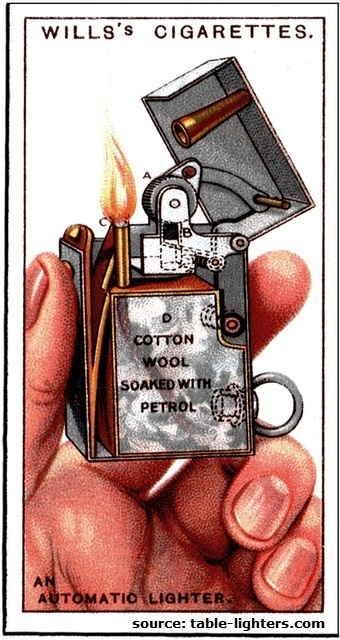 Other Wills's Cigarette Card linked to fire making is the card no. 40 that explains why is the safety-match safe. 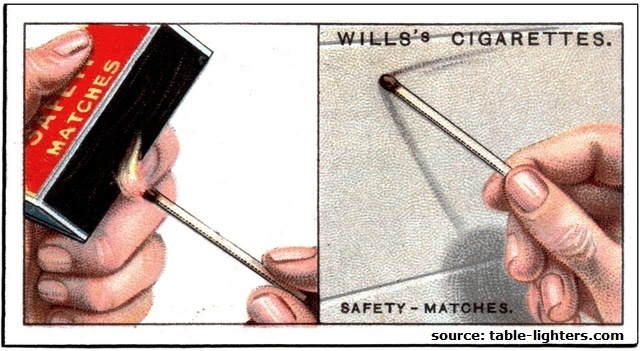 Old-fashioned phosphorus matches had many disadvantages. 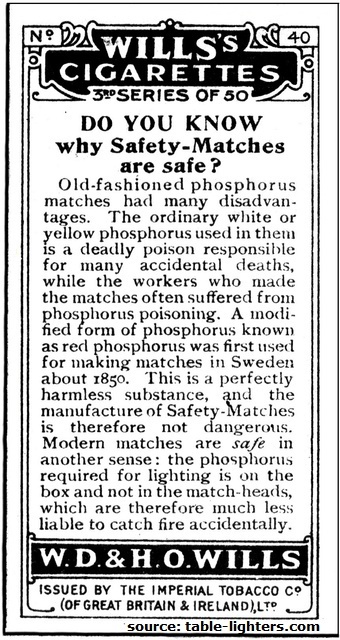 The ordinary white or yellow phosphorus used in them is a deadly poison responsible for many accidental deaths, while the workers who made the matches often suffered from phosphorus poisoning. A modified form of phosphorus know as red phosphorus was first used for making matches in Sweden about 1850. This is perfectly harmless substance, and the manufacture of Safety-Matches is therefore not dangerous. Modern matches are safe in another sense: the phosphorus required for lightning is on the box and not in the match-heads, which are therefore much less liable to catch fire accidentally.